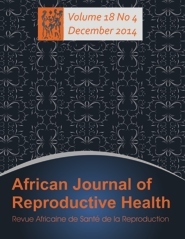 African Journal of Reproductive Health (AJRH) is a multidisciplinary and international Journal published quarterly (March, June, September, and December) by the Women's Health and Action Research Centre (a Non-governmental Organization with headquarters in Nigeria). The publication of the journal started in 1997. As of December 2014, 59 editions have been published.